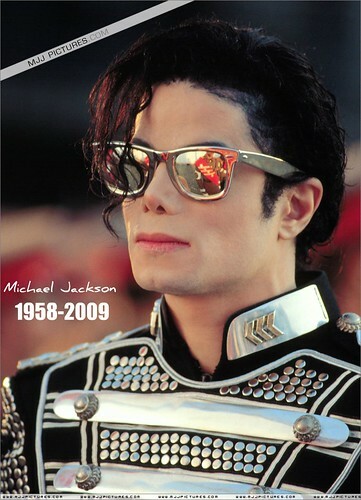 Michael Jackson 1958-2009, originally uploaded by chande legion. Michael Joseph Jackson (August 29, 1958 – June 25, 2009) an American recording artist, entertainer and businessman. The seventh child of the Jackson family, he made his debut onto the professional music scene in 1968 at the age of 11. He then began a solo career in 1971. Referred to as the "King of Pop" in subsequent years, his 1982 album Thriller remains the world's best-selling album of all time and four of his other solo studio albums are among the world's best-selling records: Off the Wall (1979), Bad (1987), Dangerous (1991) and HIStory (1995). Jackson donated and raised millions of dollars for beneficial causes through his foundations, charity singles, and support of 39 charities. Other aspects of his personal life, including his often changing appearances and eccentric behavior, generated significant controversy which damaged his public image. His achievements include multiple Guinness World Records—including one for "Most Successful Entertainer of All Time"—13 Grammy Awards, 13 number one singles in his solo career, and the sale of 750 million records worldwide. At the time of his death, he was preparing for This Is It, a series of 50 concerts that would have been held in London beginning July 13, 2009.